The G12 (Government of Twelve) Vision is a tool that God has given His children to facilitate the ultimate and greatest revival in the history of the world. For centuries, God has been preparing His Church for such a time as this and has awakened the hearts of families worldwide with a burning desire to learn about the G12 Vision and be used by Him in ministry. 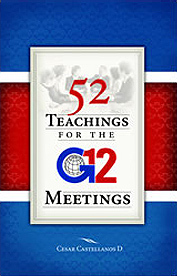 In 52 Teachings for the G12 Meetings, Pastors Cesar and Claudia Castellanos open their hearts and share the experiences that have catapulted them as internationally renowned leaders. After personally applying the principles found in this book, the Castellanos’ witnessed firsthand, an unprecedented growth that was not just reflected in numbers, but in the magnitude of corporate holiness as well.